Now that my oldest daughter has started kindergarten(!) I'm able to have a little more free time during naps to complete some projects. My sweet new baby is 8 months and I also have to keep up with my energetic three year old. But gosh darn it if I can try and sell some furniture while I do it all. I'm calling this a closet, because it originally had doors on it. 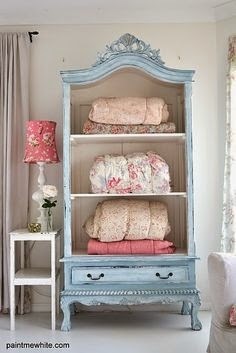 I like the look of an open closet, especially when you have lovely blankets and sheets to show off. I think this would look excellent in a guest room or at the end of a hallway. It also has a rod tucked into the top so you can hang clothes on it as well. I would love to keep this. I realized as I was gathering blankets from around the house there wasn't a central location for all of my extra blankets. They all reside in separate closets or are strewn around the house. This piece is for sale. Contact me if you are interested. oh yeah, and let's not forget the before picture. Also,I wanted to share my inspiration picture with you. I was contacted by an awesome vintage furniture website, Chairish, to create a style board using some of their colorful accent chairs. I had never done something like this before, so I figured I'd give it a try. Turns out, I loved it and I wouldn't mind doing it again. The challenge was to use one of their accent chairs to create a colorful room design. I chose this gorgeous little orange number and I loved the idea of using two of them in the room. 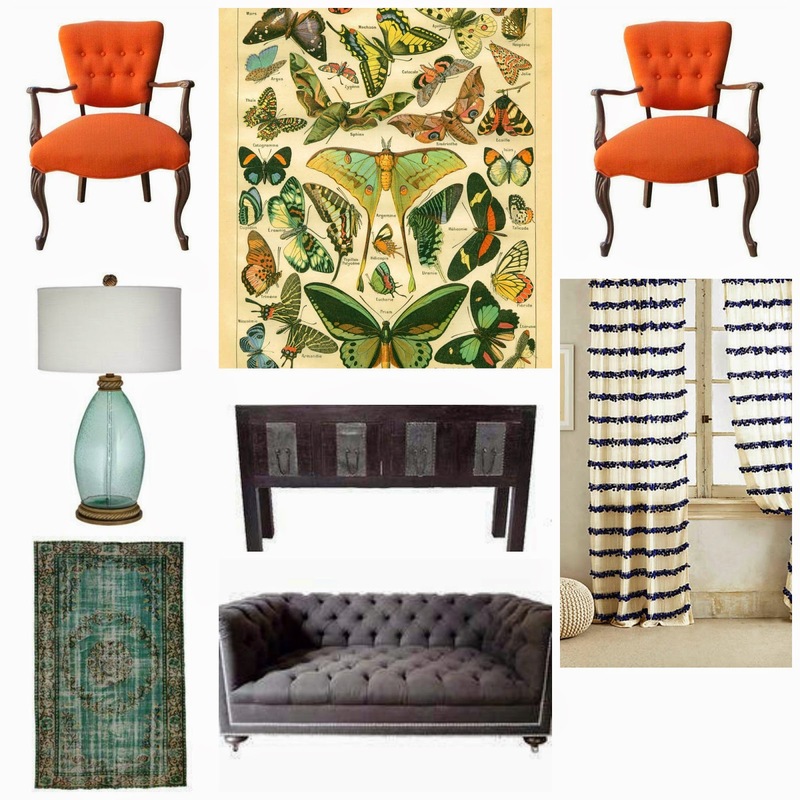 The butterfly print is one I have always loved and I feel it really brings together all the colors in the room. I chose this rug from Chairish as well. I think vintage looking rugs really stand out among more modern furniture. The lamp I chose because of it's elegant shape and soft, blue hue. I love blue with orange. The console table I chose is simple and classic. It stands out just enough but doesn't steal the show. The curtains add a little texture to the room, I love the fringe on them. The blue goes nicely with the other colors in the room. And the sofa is just cool. Grey and turquoise is one of my favorite color combos.